Likes: Syrup coated anko dumplings; Umeboshi; Anmitsu; Word Puzzles; Studying her medical studdies. 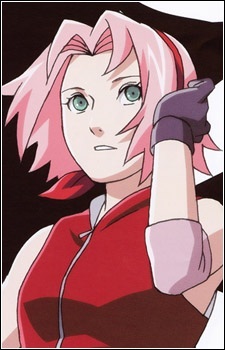 Sakura is the only female ninja of Team 7. When she first meets Naruto she is physically weak and has an immense crush on Sasuke. She dislikes Naruto as well.The only thing she's good at is her brain as the smartest girl in ninja academy her excellent chakra control, out of that she could be categorized as a kunoichi. In the first part of the Chuunin exam she is easily able to answer the questions, but in the second part she is unable to defeat the Sound ninja attacking Sasuke and Naruto. She makes a pledge to become a better ninja and a better person. To prove her commitment she cuts her long hair with a kunai. In the third part of the Chuunin Exam she goes up against Ino Yamanaka, her former friend but current rival for Sasuke's affections. The two defeat each other simultaneously. This turns their relationship in a rivalry between friends. After the time skip she is now a chuunin having been trained by Tsunade for the past two years. She is now a medic Ninja of considerable skill, enough skill to possibly defeat Tsunade one day. It is shown when she is able to do a complicated surgery to extract poisons out of Kankuro body and make an antidote of the new type poison that Sasori used,which the Suna gakure medical-nin unable to do. During the time skip she's also matured in personality, she become calmer compare when she were Genin, but she still has her temper especially when Naruto is fooling around in front of her she will beat him up into a bloody pulp. Sakura has grown not only as a medical-nin, now she's also a capable fighter. She can manage to destroy the ground with her fist using her inhuman strength, a chakra control technique she learned from Tsunade, and she is also able to beat Sasori from Akatsuki together with elder Chiyo from Sunagakure. Additionally she is a genjutsu type, and though she has yet to use that potential she does show an almost complete immunity to being trapped in an illusion. Sooner or later it happens, even the most headstrong of anime girls break down and start crying! Their emotions are overwhelmed by fateful events which force them to shed a tear, or two. We won’t judge them, but we’ll certainly be there for them if they need a shoulder to cry on. As our beloved medium grows bigger and bigger, it has become apparent that certain anime names are used more often than others... a lot more often. Here is a list of the 20 most common names for boys and girls in anime.